Stronghold ICF is a new insulated concrete form developed by industry veterans with extensive field and architectural experience. The driving philosophy behind Stronghold is to remove the most common stresses associated with installing ICFs. The block has several built-in features that eliminate the need for in-field fixes by installers. 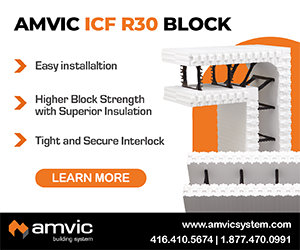 Stronghold ICF webs lock together and don’t settle or separate during concrete pours. Thicker denser foam with ties evenly spaced do away with bulging seams. Product testing is underway with completion expected in spring of 2019. 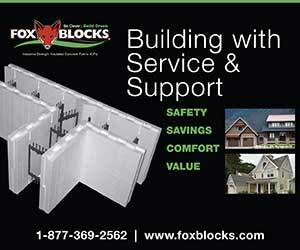 Currently, Stronghold blocks are available in 6” and 8” core sizes. Straights, 45s, 90º corners, brickledge, T-block, taper tops, flat tops, and ½ and ¾ height blocks are available with more sizes coming. Logix, a major manufacturer of insulated concrete forms, has reorganized its corporate structure and branding. The move is one of the first taken by Andy Lennox, who recently took over as company president. (See story page 12). Lennox says, “I am pleased to announce that our organization will operate from now on as Logix Brands Ltd. Our new Logix Brands identity perfectly reflects our ongoing commitment to the development of innovative and value-added products for a better and more sustainable future. As part of the move, the company has updated their logo and rolled out a new website, www.LogixBrands.com. New data from the U.S. Chamber of Commerce indicates that more than 90% of contractors are concerned with labor shortages. Additionally, nearly half (47%) expect the problem of finding skilled workers to worsen in the next six months. Placing a distant second on the list of concerns, about two-thirds (63%) said fluctuating steel prices were affecting their profitability. The survey revealed that contractors have an average of 9.3 months of work backlog, and nearly all (96%) report high or moderate confidence in the market’s ability to provide them new business over the next 12 months. More than half (52%) expect to see revenues increase in this year compared to 2018. The research was developed in conjunction with Dodge Data and Analytics, a leading provider of data for the commercial construction industry. At a press conference held at the 2019 World of Concrete, Ed Sullivan, executive vice president and chief economist for the Portland Cement Association (PCA) detailed his predictions for the economy and the commercial construction sector in 2019. Still, Sullivan expects growth rates to slow considerably. “Cement consumption will slow,” he says. “Increases in interest rates, the aging recovery, and international trade issues may contribute to the slowdown in the cement market.” PCA is forecasting a 2.9% increase in cement consumption in 2019. On the residential side, Sullivan predicts that rising interest rates will likely soften what has been a strong trend for homebuilding in the U.S. Additionally, while rising labor costs affect construction as a whole, he says the biggest hit will be to single-family home construction where there is less room to raise wages. 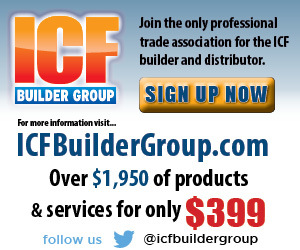 IntegraSpec, the Kingston, Ontario-based ICF system, unveiled a new logo and website at the World of Concrete tradeshow. The revamped website features a streamlined and simplified design, improved functionality, and enriched content areas to help developers, architects, design professionals, engineers, and contractors make well-informed decisions about their building needs and goals. The new logo, prominently featured on the site, reflects the system’s mechanical interlock. Shelly Faye, marketing manager, says the new red color scheme reflects passion, energy, and dynamism. “We are thrilled to debut our new website to our customers, clients, partners, media, and visitors who are looking to understand the superior advantages and breadth of IntegraSpec’s products and services,” said company founder and president Michel Philippe. Visitors are encouraged to explore the new website and direct product or service inquiries to the Contact Us page. PolycreteUSA, the Virginia-based ICF with metal ties, has created a new three-part series to introduce newcomers to their system. The three-part introduction applies only to Polycrete ICFs, as the company offers a number of unique services, including design consultation, panelization options, and other alternatives not generally available. The first segment explains how the company will work hand-in-hand with architects, owners and contractors through the design stage. The second segment covers the pre-construction stage, and the final post in the series deals with the construction process. The end goal is to ensure the owner gets the results they deserve. For more information, visit polycreteusa.net.